Emperor Alexander III began his reign with the slogan: "Autocracy, Orthodoxy, Nationality. " In the Army, a period of "simplification"and "Russification" uniforms. In March 1882 footguards received double-breasted uniforms without buttons. Color uniforms the lower ranks was a very dark green, almost black. Life Guards Pavlovsky Regiment while retaining their old differences are: dark green with red edging collar and red cuffs with flaps, red edging on the side of his uniform and trousers. Buttonholes on the collar and cuff valves were made of yellow trimmings. Red Shoulder straps. Cap with a white band and red edging. "Porch" musicians were of red cloth, jointing yellow Guards trimmings. Belts of ammunition from the white skin. Holster and cartridge pouch of light-brown skin. Revolver cord white. Body of a drum made of red copper, hoops painted in white and black with orange trim triangles. Drumsticks are white. Ceremonial headdress in the Life Guards Pavlovsk Grenadier Regiment were the famous hat with a brass plate forehead, as "usual monument cancel his courage. " In the Life Guards Pavlovsky Regiment recruits were taken with a characteristic exterior - the snub-nosed, in memory of Emperor Pavel Petrovich. 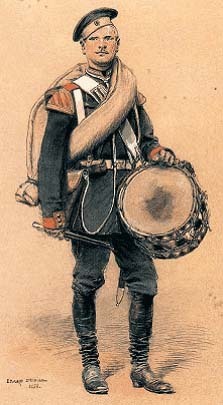 Notify me of updates to Drummer of the Life Guards Pavlovsky Regiment, in 1884 Russia.